NEW | Etched or Custom Engraved - WILDBUBZ® Natural raw beech wood timber rattle teether toy, silky smooth with the sweetest woody sound rattle. It has a larger than average 8cm diameter, making it just a little bit more special than others on the market. Add a special touch from our pre engraved options, or let us create a custom design just for you or your baby's toy / gift. A perfect gift for a baby shower, new or teething baby. Every rattle comes in it's own re usable bag. YES we offer wholesale, please see more here! 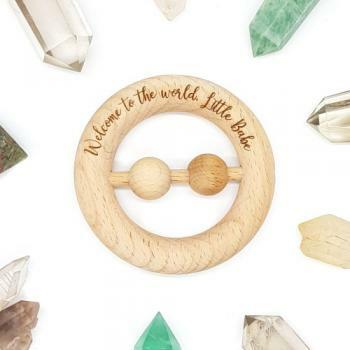 Beech hardwood Teething Ring teether toy. that does not splinter, making it perfect for little hands and mouths.